Flight attendant Skye Armstrong has heard the voice of warning before, and as she’s returning home from London, she recognizes the feeling of dread that accompanies her sixth sense. Walking from the airport terminal to her car, she pauses in the middle of the road. Her hesitation gives a Good Samaritan the split second he needs to pull her out of the path of a speeding car, saving her life. But her misfortunes are just beginning. When she arrives home, she discovers that Auntie Marjorie has been kidnapped, and cryptic instructions have been left behind: Skye must retrieve the contents of a safe deposit box and deliver it to the captors . . .No police. Her feelings of dread return. What secrets are hidden within the illuminated pages, and who believes they are worth killing for? And what roles does the Good Samaritan play in all of it? I LOVE books like this one. It has a killer plot that will keep you guessing, great characters and it’s just a great book! Bloodline starts out in 1371, but quickly jumps to the present day. Skye Armstrong is the main character and the reader sees everything through her eyes. This really worked with this book, because, just like Skye, the reader has no idea who she can trust or who she should run from. And Skye spends a lot of time running. There are so many characters in this one. There’s Skye’s Auntie Marjorie who Skye is super worried about. Jack, the man from the airplane who saves her life at airport. And Professor Sumsion, Auntie Marjorie’s boyfriend. I had no idea who she could trust. There’s always someone after Skye in an almost uncanny way. That really kept me guessing! This book didn’t take me long to read. That’s probably because I didn’t want to put it down. I guess I was afraid I’d miss something if I did. Plus Skye needed me to know what was happening to her! Make sure to read it, I hope you love it as much as I did! 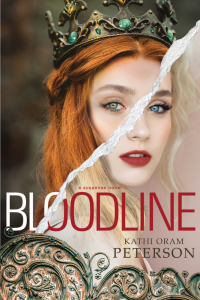 I was sent a copy of Bloodline as a gift from the publisher. All opinions are my own.